Thank you for visiting Eye Candy Event Details Design Shop on Etsy! Introducing our NEW Happy Birthday EASTER chick - Birthday Party Invite - DIY Printable Invitation. 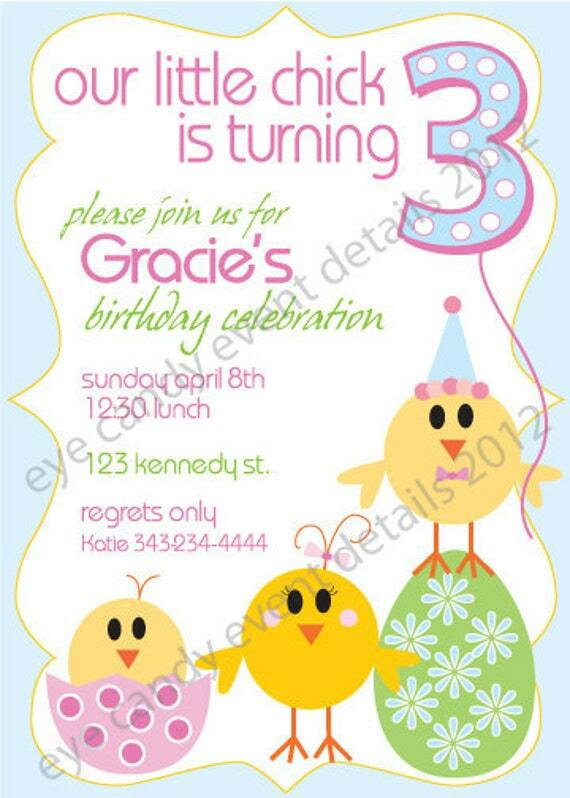 This invite is perfect for those little chicks who celebrate their birthdays around EASTER! Celebrate their birthday AND have an Easter egg hunt . . . ideas are endless! ~ This invite is sized to 5"x7", 2-up on 8.5"x11, and uses a multi-color color scheme. Look for A7 envelopes for mailing. Needing more for your event, be sure to check out the matching DIY Printable Collection also in our Etsy Shop!!! Make sure to include wording when purchasing so we can customize for your celebration! DESIGN/COLOR CHANGES are NOT included. But can be done for an additional fee. Allow 1-2 business days for customizing the invite. Once payment is received a watermarked proof will be sent to your email for your approval, then once approved the final un-watermarked version will be emailed to you. Because this is a personalized item all sales are final so please make sure to review your proof carefully before approving it!